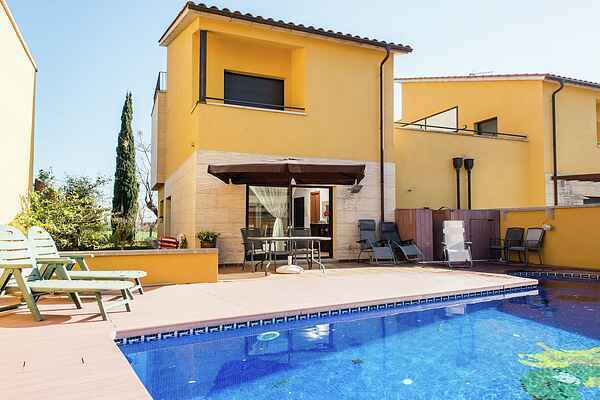 This cozy holiday home has a private swimming pool and is close to the beautiful village of Sant Pere Pescador, only 1 kilometer from the spectacular sandy beach. The beautiful home has two floors and is cozily and homely decorated. You have a large living room with a cozy sitting nook as well as a separate dining corner. Thanks to the number of bedrooms and bathrooms everyone has sufficient privacy. All bedrooms have air conditioning. The simple kitchen is fully equipped and outside you have all the luxuries. That way you can enjoy the terrace in the garden or have a refreshing dip in your private swimming pool. You are staying in a quiet residential area only 1 kilometer from the center of the village of Sant Pere Pescador in the bay of Roses, only 1 kilometer from the beach. Close to the home there is a gorgeous nature reserve, the perfect place to go walking, biking or even fishing. Sights in the area include nature park \"Aiguamolls Emporda\" (4 km), the ruins of Sant Marti d'Empuries (at 5km), the Salvador Dali museum in Figueres (17km) and nature park \"Cap de Creus\" (30km). You can also play golf at the Peralada Golfclub in Peralada (32km).